Registration fee: 650 €/student. Fee includes all tuition, 2 field trips, 8 nights’ half-board, shared accommodation (22-30 May) and coffee breaks. Course Outline: Geothermal energy has become a viable alternative and sustainable source of energy in many countries. The energy is commonly manifested on the Earth’s surface in the form of fumaroles, hot springs, geysers and steaming or altered ground. Economically viable geothermal energy occurs close to the Earth’s surface where it can be tapped by drilling wells up to 3,000 m below the Earth’s surface. Geothermal surface exploration invariably entails a multi-geoscientific process, which is aimed at defining the geometry and characteristics of the geothermal system prior to drilling. The scientific disciplines commonly involved are geology, geochemistry, and geophysics. The geological approach generally aims at understanding the various lithologies, volcanological evolution, structural controls, and hydrological regimes of the system. Geophysical exploration helps in determining the geometry (shape, size and depth) of the heat sources, reservoir and cap rock. It also aims at imaging structures that are responsible for the geothermal system, and delineating the areal extent of the geothermal resource. The most commonly used geophysical methods are electromagnetic/electric, gravity, magnetics, microseismicity, seismic tomography and thermal infrared remote sensing. Geochemical exploration relies mostly on sampling and analysis of water, steam and gas from the thermal manifestation in order to characterise the fluids, estimate equilibrium reservoir temperature, determine the origin, evaluate mixing scenarios, determine the suitability of the fluids for the intended use and locate recharge areas and direction of fluid flow. Additional geochemical studies involve soil diffuse degassing measurements aimed at identifying gas leakages that usually mimic active faults and structures. 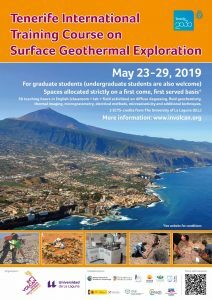 The aim of this course is to introduce graduate students to geophysical and geochemical methods used on surface geothermal exploration by alternating lectures with practical laboratory and field activities. The week-long course costs 650 € (EUROS) per student. The course will take place from 23-29 May. Students from abroad are asked to arrive in Tenerife on 22 May ready for a 9 am start the next day. The course finishes at 18:00 on 29th May. You must be available in Tenerife for the full period stipulated, and attend and participate throughout to qualify for your credits at the end of the week. Transfers to/from the hotel and the airport on arrival and departure. You can fly to either of the two airports in Tenerife – both are well connected by bus or taxi. The North airport (Rodeos) is about 20 minutes from Puerto de la Cruz, and the South airport (Reina Sofía) is about 1 hour and 20 minutes away. The organization will offer scholarships to attend this training course. The INVOLCAN scholarships (900€) will cover the registration fee (650 €) plus a stipend of 250 € towards flights and/or other incidentals (1 for every 20 places booked). The ULL scholarships are promoted by ULL and INVOLCAN and will be offered to ULL students, covering 50% of the registration fee (325€). Housing will not be offered to ULL students. In order to apply for a ULL scholarship, please send an email to geothermal.exploration@involcan.org and write 2019 SGE ULL Scholar in the subject line of your application. Please send a cover letter outlining why you deserve a ULL Scholarship and an academic CV to support your application. 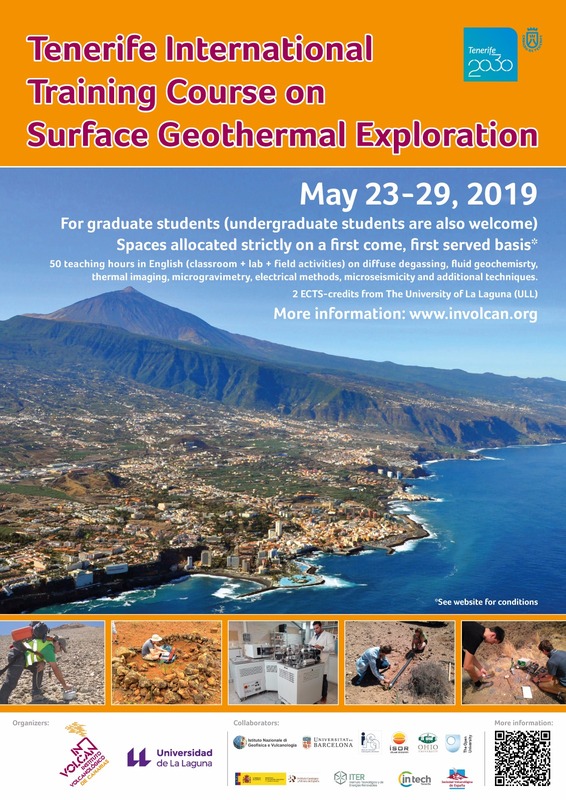 In order to apply for a INVOLCAN scholarship, please send an email to geothermal.exploration@involcan.org and write 2019 SGE INVOLCAN Scholar in the subject line of your application. Please send a cover letter outlining why you deserve a INVOLCAN Scholarship and an academic CV to support your application. Fee includes all tuition, field trips, 8 nights’ half-board, shared accommodation (22-30 May) and coffee breaks. You may, of course, leave after 18:00 hours on 29 May if you prefer, but no reduction will be made on the inscription price if you stay one less night. Supper will be included on 22 May for those arriving at the hotel by 18:00 hours. The course requires a minimum of 15 students to run – if less than 15 have signed up by 22 March 2019, your fee will be returned and the course will not run. Organizers will hold no further liability to you. The website of INVOLCAN, co-organizer of this course, will record how many places are taken/left available. We therefore suggest you do not book flights or undertake any additional expenses until at least 15 places have been booked. The subject of the payment must state clearly Geothermal Exploration Registration Fee. Please send a copy of the bank transfer to geothermal.exploration@involcan.org in order to check your payment.